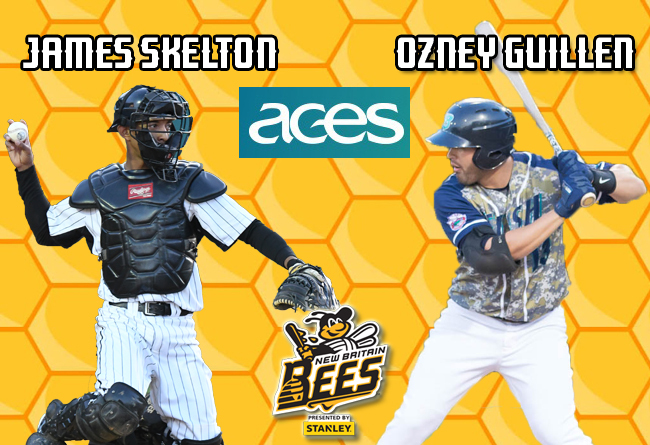 (New Britain, Conn., April 10, 2018) – The New Britain Bees today announced the signings of catcher James Skelton and outfielder Ozney Guillen. James Skelton returns for his third season with the Bees, sixth in the Atlantic League, and 15th of professional baseball. Last year with New Britain, the backstop appeared in 117 games, collecting a .255 batting average with 14 home runs, 33 RBI, 69 runs scored, 17 stolen bases, and a .408 on-base percentage. He also tied an all-time Atlantic League single-season record with 101 walks drawn. The 32-year-old was originally drafted by the Detroit Tigers in the 14th round of the 2004 MLB amateur draft. He would spend five years in the Tigers organization, and continued to play in the affiliated ranks through 2012. Skelton peaked at the Triple-A level with Louisville (Reds) in 2011, and Syracuse (Nationals) in 2012. He made his Atlantic League debut in 2013, and has played in the league since with the Somerset Patriots, Lancaster Barnstormers, Southern Maryland Blue Crabs, and Bees. In 1,080 career minor league games, James owns a .258 batting average with 59 home runs, 405 RBI, 550 runs scored, 145 stolen bases, and a .390 on-base percentage. Ozney Guillen joins the Bees for his second season in the Atlantic League and fifth of professional baseball. Last year, the outfielder played with the Bridgeport Bluefish, where he hit .253 with two home runs, 29 RBI, 30 runs scored, and five stolen bases across 86 games. Ozney is the son of former Chicago White Sox Manager Ozzie Guillen and was originally drafted out of high school by the White Sox in the 22nd round of the 2010 MLB draft. He made his professional debut in 2014 with Normal of the independent Frontier League and spent two seasons with Normal before joining Sioux Falls of the American Association in 2016. In 233 career minor league games, the 26-year-old owns a .241 batting average with 16 home runs, 127 RBI, 132 runs scored, and 32 stolen bases.